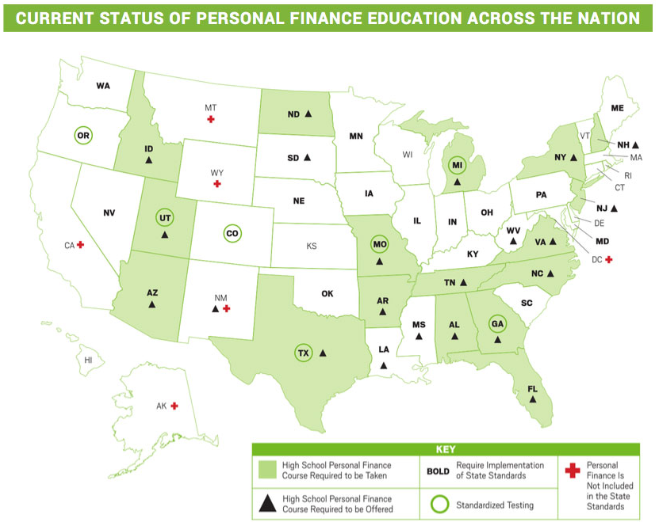 According to a 2018 Council for Economic Education study, 45 states include personal finance in their K–12 learning standards, 37 states require districts to implement those standards, 22 states require high schools to offer a personal finance course, 17 states require a high school personal finance course to be taken, and 7 states engage in standardized testing of personal finance concepts. The added requirement of a taking a personal finance course in high school in Alabama, Missouri, Tennessee, and Virginia has earned these states an A on the 2017 Champlain College’s Center for Financial Literacy “National Report Card.” Utah, the only state that requires a state-administered test at the end of the course, received an A+. Meanwhile, 27 other states that don’t have a personal finance course as a requirement earned a C or lower. After taking a look at these stats, it’s easy to wonder if students are being prepared enough in school to make confident financial decisions as adults. Financial literacy is key when it comes to developing a healthy and functional relationship with money as an adult. If students aren’t talking money with their parents, it’s important for other trusted adults, like educators, to take on this role. After high school, many students must figure out not only how they will begin living on their own and paying their expenses but also how they will fund their college education. Today, 70 percent of college students graduate with a significant amount of loans. As of 2018, more than 44 million students around the nation have accumulated trillions of dollars’ worth of student loans. It’s important for students to understand interest rates and repayment plans and to comprehend how setting up a savings account while they are in school can help them prevent any sticky situations as they are paying off their loans. Understanding credit and credit scores can be confusing and difficult. But, with a good or excellent credit score, students will be able to do things like rent an apartment, buy a house, refinance student loans, or get a credit card. This is a crucial concept for students to understand. It’s not uncommon for students to accumulate a lot of debt. With expenses such as student loans and their first credit card payment, debt can really add up if you don’t understand how the credit system works. Many young adults make the mistake of overspending with a credit card without accumulating enough income to pay off their expenses. If they don’t understand this process, it could take several years to pay off that debt. If students understand financial concepts, they are more likely to set aside money for saving. Many students are unaware of the amount they will need to save for emergency funds, for a down payment on a house, and even for retirement. Knowing how to save money properly can help students achieve financial independence faster, prepare for large or unexpected expenses, and develop healthier spending habits as adults. Educating students on personal finance will only benefit them in the future. Personal finance courses usually cover topics such as investing, saving for retirement, and maintaining good credit. Taking these courses will help students gain financial literacy, make smart decisions with their money, and guide them toward living comfortable, independent lives. If you’re looking for a way for your students to take a personal finance course, check out Edmentum’s course catalog. Our Courseware offers an online personal finance course for secondary level students.